I thoroughly enjoyed New York City Ballet great Jacques d’Amboise’s presentation at the Barbara Biber Lecture at The Bank Street Graduate School of Education Monday evening. The fast moving hour plus presentation featured dances by students in d’Amboise-founded National Dance Institute (NDI) programs; also, a wide ranging discussion by d’Amboise of his storied career at New York City Ballet, thoughts on the power of dance and the arts in fostering child development, and techniques that NDI uses to teach dance to children. The lecture opened with a demonstration by a group of students in the NDI program. d’Amboise founded NDI in 1976, which works with New York City school children through weekly classes, short-term residencies, and public performances. 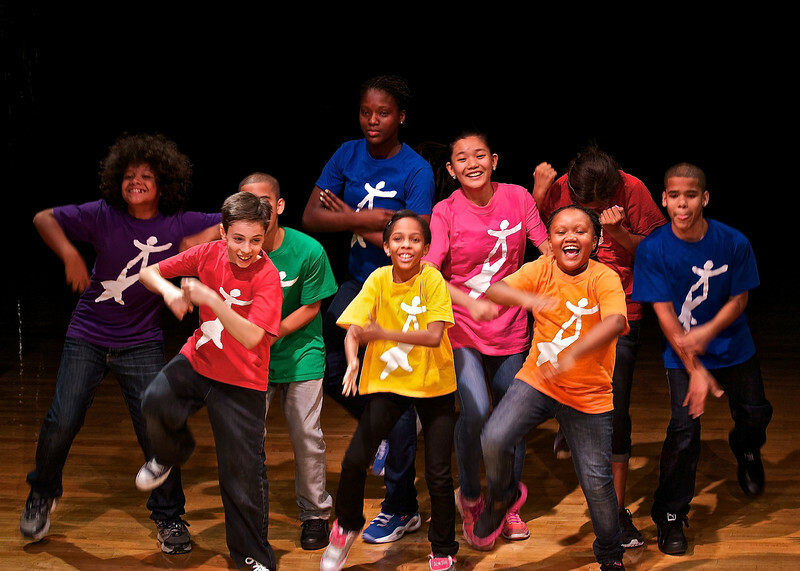 NDI currently partners with 31 New York schools and serves 5,000 children each week from K-6 grades, according to the NDI website. The dance was an energetic, foot stomping American folk dance performed by nine students that reminded me of several dances in Agnes de Mille’s Rodeo. This was an Appalachian clog dance, inspired by his 1999 Appalachian Trail hike to fulfill his dream of back-packing the trail and raise money for arts education. He gave a background on the dance, influenced African and Cherokee traditions. He then went into a wide-ranging discussion starting with the basis for all arts-dance and architecture: dance, which humans developed to express emotions by controlling how we move through space and time and architecture, involving the ordering of everything. While discussing his philosophy of the arts he digressed with a story of his first role with George Balanchine as Puck in Midsummer Night’s Dream while demonstrating a few steps. At age 79, he still has the moves with his poised, elegant dancer build. Also, he made a comparison of the late Maria Tallchief’s eloquent dancing feet to poetry. As Bank Street is a teaching college, d’Amboise presented techniques on teaching children to dance. Mary Kennedy, a Master Teaching Artist at NDI, and Jerome Korman, Music Director at NDI, accompanied him. For one series of steps, teachers had students imagine they are in the center of a clock followed by instructions to jump to 3 o’clock, 6 o’clock, 9 o’clock and so on. The staff demonstrated this teaching device in several dance sequences with the students. How do the teachers deal with students that are slow to catch on? There is not a front row of proficient students and a back row of slower students at NDI. Instead, D’Amboise said-with great passion-that the most important person in class is the one with the most trouble. He and Kennedy demonstrated how other students can help out other students and the process by which they pretend they are dancing in water in an effort to slow down the pace of the dance. In a touching part of the presentation, he recounted his last meeting with his former dance partner Melissa Hayden. In a hospital with cancer, she said to him, “You came for my last dance.” For the audience, he then presented a memorial to his long-time dance partner consisting of poetry and gestures. As with all dances, he closed out the lecture with bows to the crowd and a story of how prima ballerina Alexandra Danilova, who left Russia with Balanchine in the 1920’s, greatly improved his bowing technique. After a great performance of Swan Lake followed by subpar bows to the crowd, Danilova took d’Amboise aside and taught him to project to the upper reaches of the audience in grand gestures, followed by an embarrassed “Aw shucks” look as he backed away from the crowd. He laughed and waved goodbye to an enthusiastic Bank Street audience. d’Amboise was a Principal Dancer with the New York City Ballet for almost 35 years before retiring in 1984. He was also in films such as “Seven Brides for Seven Brothers” and “Carousel.” He received a number of awards for his dancing and work at NDI including a MacArthur Fellowship, a Kennedy Center Honors Award, a National Medal of the Arts, and Honorary Doctorate Degrees from a number of colleges, including Bank Street. For more information, see the NDI website, Macaulay’s New York Times review, and The Paris Review. The Bank Street College of Education is a private, nonprofit educational institution in the Morningside Heights area of Manhattan, near Columbia University. Bank Street was founded in 1916 by Lucy Sprague Mitchell, the first Dean of Women at the University of California, Berkeley. The college consists of a graduate school and an on-site independent School for Children up to eighth grade. The Barbara Biber Lecture kicks off the school year for incoming students, along with former students and faculty.